Offaly is an Instagram hit according to new research from the Maldron Hotel in Portlaoise. 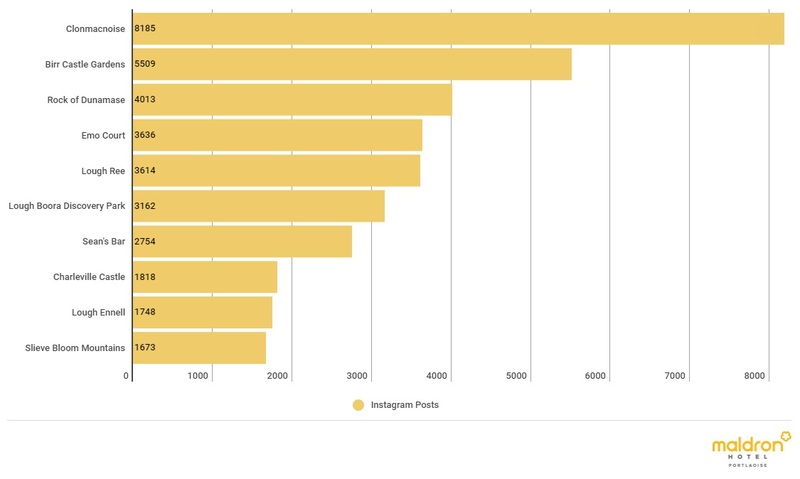 They decided recently to trawl through over 30,000 hashtags to find the Midlands' ten most Instagrammed spots, and it appears Offaly dominates the list. The Maldron wanted to find out the most popular locations that both locals and tourists tag on Instagram to show their love for Offaly, Laois, Longford and Westmeath. The Midlands is full of fantastic landmarks and landscapes and all counties scored at least one spot in the Top 10 but Offaly was the cream of the crop, taking the top two spots. The monastic site at Clonmacnoise claimed top spot, followed by the picturesque and historic Birr Castle Gardens. Laois settled for third spot with the Rock of Dunamase. In total, five spots located in Offaly made the Top ten with Lough Boora, the Slieve Blooms and Charleville Castle joining Clonmacnoise and Birr Castle. So there you have it - Offaly is the most Instagrammable county in the Midlands. See more from the Maldron research by clicking here.